The 2015 harvest signalled a significant ten year milestone for Waterkloof – the biodynamic wine estate overlooking False Bay in Somerset West – as it celebrates a decade of winemaking and working in harmony with nature to craft wines of vitality, individuality and sustainability. It took ten years for Paul Boutinot, Waterkloof’s custodian and British wine figure, to narrow down his global search for “a vineyard site with the potential to produce truly fine wines with a defining sense of origin”. Following extensive experience making wines (with other people’s grapes) in Europe and latterly in South Africa, his search led him to the coastal outskirts of the Stellenbosch wine region in 2003. 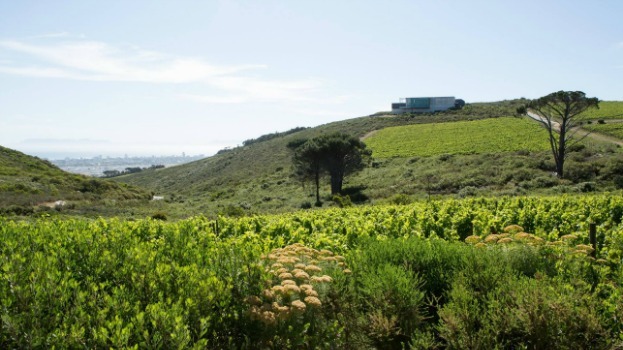 It was here, on the elevated, windswept slopes of the Schapenberg, where a natural amphitheatre of vineyards, mountains and uninterrupted views of False Bay, exude the fairest Cape’s natural beauty, that Paul would establish Waterkloof and begin making wine in 2005. “I chose Waterkloof for site specific reasons. It just happened to be in South Africa, just as Romanée-Conti just happens to be in France. If I went back in time I would make the same decision…only quicker. We have worked hard, learned and improved a lot over the past decade, with more still to come!” shares Boutinot. 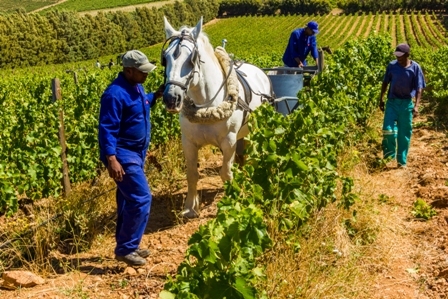 Waterkloof’s first harvest saw only three grape varieties, Sauvignon Blanc, Merlot and Chardonnay harvested from 20 hectares of conventionally farmed vines that had been planted there since the mid-1990s. 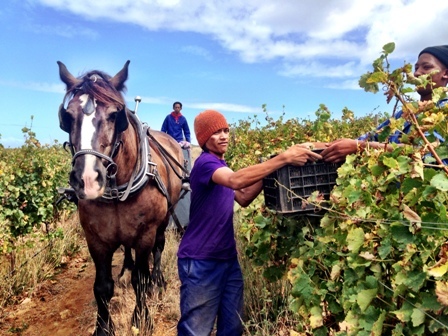 There was no cellar, so they had to haul the grapes to Paarl for vinification. Those vines, which were once planted in depleted, conventionally farmed soils, have slowly but surely been transformed, and ten years on, in their own gravitational cellar, Waterkloof vinify grapes from vines which thrive on a living, biodynamic farm. Today Waterkloof has 56 hectares under vineyards. In addition to changing the way the land was farmed, there was also a reassessment regarding which grape varieties were suitable for the site, with emphasis being placed on matching variety to terroir, rather than planting varieties that were popular in the market. With that in mind Mourvèdre, Syrah and Chenin Blanc made up the majority of the new plantings having been judged as potentially ideal matches for what is a particularly unique site. Meanwhile, almost all the chardonnay was uprooted, as it was deemed more suitable to the limestone soils and cold winters of continental areas such as Burgundy in France, rather than the predominantly sandstone/granite soils and relatively mild winters of the Western Cape. “All the ‘experts’ told us never to plant Mourvèdre on Waterkloof, as it can be a difficult variety in the wrong place and was apparently ‘unsellable’. But with rocky granite soils, and warm summers, with cooling sea air blowing in off False Bay, there were some striking similarities to Bandol in Provence. Never one to follow the ‘experts’, we are proud to say that Mourvèdre is the most planted red variety on the farm. Commercial suicide some might say, but the results are bearing fruit in our Cape Coral rosé. As for the Chardonnay we pulled out, there are undoubtedly good examples to be found in many places around the world, including South Africa, but for me, personally speaking, there is only one place with truly great Chardonnay and that is not South Africa!” Boutinot explains. One of the most important motivators for Paul’s global search was the climate. At Waterkloof there is a sharp drop in afternoon temperatures with strong winds coming in off the Atlantic that are funnelled up a ravine (the “kloof”) and then spread over the estate’s amphitheatre of south-facing vineyards. The wind enables naturally low yields and a long, slow growing season, both of which are fundamental factors in producing grapes with complexity, concentration and natural acidity. “Without such natural attributes, it would be impossible to make wines the way we do, with almost no additions in the cellar. In most years we do add a small dose of sulphur as a preservative, but that is it: Grapes transformed into wine, with a minimum of intervention. There are only a handful of vineyard sites globally that allow for such an approach. Waterkloof is one of them,” adds Boutinot. In addition, there are two different primary soil structures present (sandstone and granite), enabling the planting of a range of grape varieties. The vines, which have been transformed by biodynamic farming methods devoid of chemical herbicides, fertilisers and pesticides, are much healthier and substantially more disease-resistant than ten years before. This, in addition to a reduction in yields, has resulted in an enormous increase in grape quality. “We’ve taken the site from its raw potential to a position where we are experiencing this quality in the bottle. 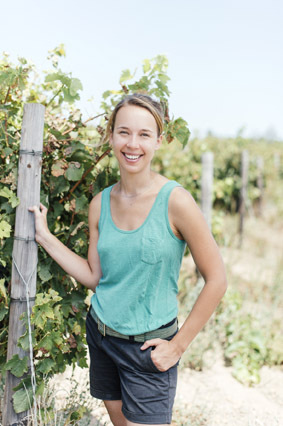 The building blocks are now in place and the wines will increase in depth as the vines grow older, whilst our essential elegant style will remain,” states Waterkloof winemaker Nadia Barnard who joined the farm in 2008 and celebrated her maiden vintage in charge of the cellar in 2013. “Expectations are high for our 10-year milestone vintage. 2015 was our very first biodynamically certified harvest and it delivered the finest quality grapes in our winemaking history. Small berries with concentrated juice, elegant acidity and lots of flavour,” added an elated Barnard. Waterkloof’s expertly designed, 500 ton cellar is both ultra-modern and geared for traditional winemaking practices such as open top, wooden fermenters for red wines; whole bunch pressing for white wines to guarantee gentle extraction, and the use of gravity to avoid excessive pumping. In pursuit of more individually styled wines, Waterkloof relies only on naturally present, wild yeasts during fermentation. Waterkloof currently produces four wine collections: Its flagship Waterkloof range which comprises a Sauvignon Blanc that epitomises their decade-long goal of producing pure, inimitable and world-class wines; the Circle of Life Red and White duo which encapsulate the ultimate essence of Waterkloof’s terroir and farming philosophy; the elegantly expressive site specific Circumstance range and its Seriously Cool range, which features a seriously cool Cinsault and Chenin Blanc, hailing from some of the oldest vineyards in Stellenbosch. Waterkloof’s sister company, False Bay Vineyards, produces two collections: the earlier drinking, yet refined Peacock Wild Ferment range, named after the brightly plumed birds conspicuous in and around Waterkloof’s vineyards and the False Bay wine range of easy-drinking yet quality driven wines of real individual character at an affordable, everyday price. Back in 2005, Waterkloof was covered in alien tree species and the existing vines were infected with pests and virus. There was almost no infrastructure, with the exception of a few eroded roads. Having made great efforts to clear the alien tree species from the farm and move down the road of sustainable and organic farming, Waterkloof was one of the first wine estates in South Africa to be awarded WWF Biodiversity and Wine Initiative Champion status for its efforts in preserving the unique and precious Cape Floral Kingdom. 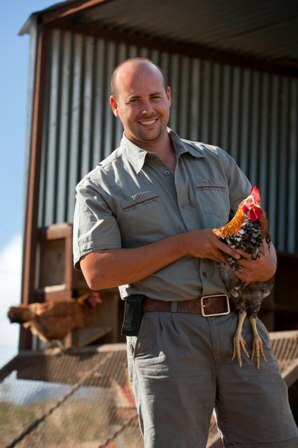 Following this achievement, Farm Manager Christiaan Loots began introducing biodynamic methods to Waterkloof in 2008. “Our conventional methods to control the pests and virus in the vines were repeatedly unsuccessful, so we were forced to think out of the box and go ‘back to the future’ with biodynamic methods. By definition, a biodynamic farm is one where the soil is without conventional problems. Most importantly, the soil needs carbon – something that conventionally farmed vineyards rarely have. This all takes time but thankfully our efforts paid off as we did start noticing real benefits in 2011,” explains Loots. Christiaan knew very little about biodynamics back in the day, but was fortunate to gain valuable knowledge from fellow sustainable farmers over the years, especially the late Jean Malherbe, a lady who lived and farmed in the mountains of Wellington and which he fondly refers to as his ‘biodynamic guru’. One of his biggest challenges was to rebuild the soil structure, as conventional farming essentially treats the soil as something to hold up the vines and nothing more. Christiaan and his dedicated team had to transform acidic, compacted soil into living soil, high in organic matter and with a diverse microbial and fungal count and the ability to nourish the vines. “The first day when our horses ploughed the soil, the first time when we sprayed the vines using our own horse carts and the first time we brought 960 kilograms of grapes per horse into the cellar, will always be stand-out memories for me. But my very best and proudest moment to date though, is this 10th harvest!” shares Loots.